Our 7th annual guide to bars, clubs & coffeehouses. Town hall meeting and a panel discussion focus on race relations. Bruce Bratton: River Street sign; Shaffer Road development; this week's movies. DIY Dress-Up: There's no excuse for failing to come up with an original Halloween costume. The Fright Stuff: A guide to ghoulish and garish happenings around Santa Cruz this Halloween. Bad Bunny: The unbalanced 'Donnie Darko' forestalls the end of the world. Saucy Jack: 'From Hell' is an atmospheric but vague retelling of the Jack the Ripper legend. Web Exclusive: Smash Mouth had plenty to celebrate at the Catalyst last Tuesday. Well-Traveled Tracks: Bob Dylan's new album may be good, but it's preaching to the choir. Sights & Sounds: Denmark's Nekomantix cancels U.S. tour; Tiger Army steps in to fill the psychobilly void. 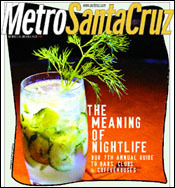 Southern Lights: An Aptos bistro offers a splendidly seasoned glimpse at refined regional American cookery.